Kiis stablemates Kyle and Jackie O who took the lead last ratings period. Jackie and Jackie O dropped 0.8 percentage points to reach 7.8% audience share. 2GB's Alan Jones continued its unstoppable winning streak in breakfast, picking up another 1.1 percentage points to reach 17.1% audience share followed by ABC702 on 8.7% audience share after dropping 1.7 percentage points in the period. In drive time, 2GB's Bed Fordham picked up the biggest audience share after gaining 0.1 over the period to reach 10.6% audience. It was followed by Nova 96.9's Kate, Tim and Marty which reached 9.6% audience share despite dropping 0.5 percentage points in the period. The biggest drop in drive came from Kiis's Hughsey and Kate which dropped 1.8 percentage points to hit 7.3% audience share. The biggest gain in total people came from smoothfm which picked up 1.0 percentage points to reach 8.2% audience share; making it the most listened to FM station. The biggest drop game from Triple M which fell 1.4 percentage points to reach 6.5% audience share. In the latest radio ratings for Melbourne 3AW continues to lead when it comes to total audience, holding 12.6 percentage points. ABC774 followed with 10.2 percentage points, with Triple M trailing with 8.5 percentage points. Macquarie Radio Network-owned 3AW also reigned supreme in the breakfast spot with its 16.5 percentage point lead. It's nearest competitor, ABC774, is a good few points behind with 13.1 percentage points and Nova100 arrives safely in third position with 9.3 percentage points. In the coveted drive-time spot 3AW fails to clutch the number one position here. It's FoxFM hit 101.9 that takes the cherry with 10.3 percentage points, climbing from 8.8 percentage points in the last ratings period. Instead, 3AW's comes in at second place with 9.7 percentage points, which is a 0.4 point drop for 3AW, from 10.1 percentage points. Kiis 101.1FM saw an increase from 9.4 percent points to 9.6 percentage points. Despite the rise it dropped to the third most listened to station in drive, from second spot. Mix102.3 has scooped the top spot in Adelaide with the station taking 14.5% of the overall audience in the city of churches. Mix saw a rise of 0.5 percentage points to further cement its lead. Nova has come in equal second with its 91.9 station tying in audience with talk-back station Fiveaa, with both stations sitting on 11.7% of total people in Adelaide. ABC891 has topped the coveted breakfast slot with 14.1%, with the station managing to hold onto its spot despite losing 2.0 percentage points. Mix102.3 saw the biggest rise in breakfast with the station gaining 1.6 percentage points to see it take second spot. In drive, Nova managed to hang onto its number one slot, with the station holding steady on 15.1%, with its closest rival Mix losing 1.1 percentage points, moving it to second place on 14.4%. ABC720 continues to rule to roost retaining its breakfast lead with 14.3% audience share, despite dropping 0.5 percentage points over the period. However the battle for the second spot picked up speed with SCA's Mix 94.5 gaining 1.1 percentage points to hit 13.2% audience share, taking over from Nova 93.7 which ended in third spot. Nova dropped 0.9 percentage points in the period to reach 12.0% audience share. Nova retained its lead in drive despite dropping 0.1 percentage points in the period to reach 15.5% audience share. Mix also dropped 0.1 percentage points but remained well ahead of the competition on 14.1% accidence share. The biggest mover and shaker was hit 92.9 which gained 3.5 percentage points to reach 12.8% audience share and third place, overtaking previously third place winners Triple J, which finished on 12.5% audience share despite - gaining 0.3 percentage points over the period. 97.3FM continues to dominate with 13.3% of audience share, followed closely by Nova 106.9 with 12.5%. Both stations are well ahead of their rivals, with Triple J coming in third at 8.9 %, with the station jumping 1.1 percentage points from the last ratings period. ABC612 has had the most significant drop since last period, down by 1.4 percentage points. Breakfast radio saw the biggest overall drop in listeners across the board, with seven out of 12 stations losing listeners. Nova has regained the lead over 97.3FM in the breakfast race with 13.5% of listeners, and ABC612 in third position with 12.7%. In afternoon drive Nova continues to maintain its grip with almost 16% of listeners, despite shedding 1.1 percentage points since last period. 97.3FM trails Nova tightly with 14.6% of audience. Triple J has gained 1.5 percentage points to win 11.3% of audience share. The 25-39 age group saw one of the biggest drops in listeners, with Triple M losing 5.9%, while Triple J had a massive gain of 4.8% to take the lead in that age bracket with 22% of the audience. 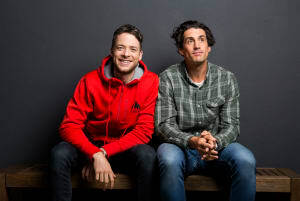 Hamish and Andy's return to the radio waves has seen Southern Cross Austereo's embattled Hit 104.1 station push to the middle of the pack in drive, with a 2.7 percentage point gain. The station picked up 6.5% audience share from 3.8% in the survey period before. Meanwhile the station's breakfast team of Dan and Maz picked up 0.6 percentage points reaching 3.9% audience share from 3.3% audience share. Breakfast also saw a shake-up with Australian Radio Network (ARN)'s WSFM hosts Jonesy and Amanda taking top FM billings despite dropping 0.2 percentage points to finish on 8.4% audience share. They overtook Kiis stablemates Kyle and Jackie O who took the lead last ratings period. Jackie and Jackie O dropped 0.8 percentage points to reach 7.8% audience share.